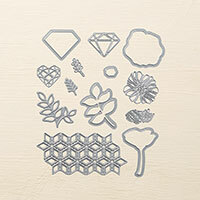 How Do You Keep Track of Your Embossing Folders? How Do You Keep Track of Your Embossing Folders? Are you like me--I just stuff mine in a plastic box and have to root around to find the one that goes with my current project--here's my box.. pretty pathetic, right? I can tell you that this is not the most convenient or expedient way to store them or to look for just the right design--I"m constantly getting frustrated by having to look through the box or not finding what I'm looking for. Today I'm going to share with you a method of keeping track of your embossing folders and of being able to quickly review the designs that you have. It's a much faster way to track and to review designs for your current project. One of Sandi's Stampers, Jackie Silvestri, was kind enough to pack all her stuff in the car and drive it to me so that I could see her system and take pics which I'm going to share with you today. You could get really fancy and put a picture of you stamping at one of our classes on the front cover, right? Next step is to run a piece of cardstock through the Big Shot with each of your folders--fit the cardstock to the size of the plastic photo holder sleeves --probably about 4 X 5. 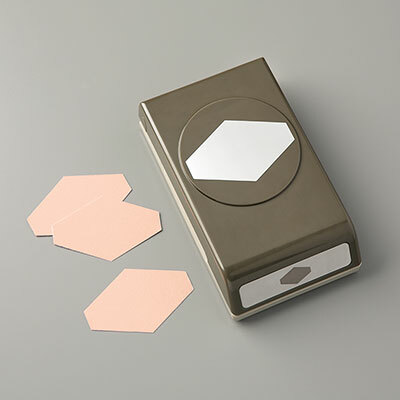 Then number your sample with the same number that is on your embossing folder, slip it in the holder sleeve in numberical order. Give it a try--let me know what you think--you can leave me a message at the end of this post or shoot me an email: sandihartka@sandilovesstamping.com. 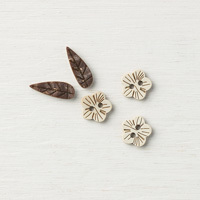 Do YOU have a hand hint for our stampers? If so, let me know and we may share it with our fellow stampers? Thanks to Jackie for sharing with us! 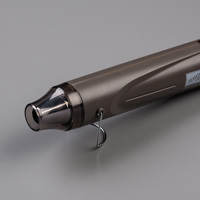 -Brown suggests stability, comfort, and dependability. Using these brief descriptions, you may first want to decide what you want your major color to convey. What do you want someone to feel when they open your card---calmness? Then maybe blue is your core color. 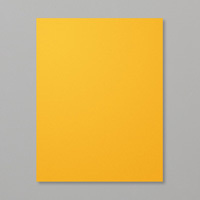 Do you want them to be excited and bubbly--try some Yellow. After you decide on your base color, then work on what other colors to use for accents or secondary colors. Now lets look at some additional sources of inspiration when you have "color block." 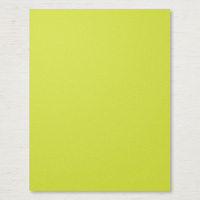 In this sample I would begin with Poppy Parade and add bits of Pool Party, Early Espresso and maybe some Granny Apple Green---I don't want to add too many colors so if I use more than 2 major colors then I'd only add very small amounts of the other colors--see how the amount of green is very very small in this sample? 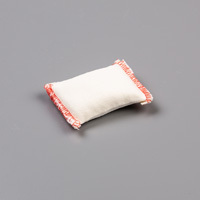 Let's try one more sample here Here it seems that Real Red is predominant and small amounts of Early Espresso add some contrast. Now they've added a bit of what looks like Blueberry Bushel--something I would not have paired up with these 2 colors but it does add a real spark of interest and contrast! So take a look around you....product packaging, clothing, store displays, nature, and on and on and on...there are endless sourcs. This card has a beautiful base of Shaded Spruce combined with a Coastal Cabana swish. Then touches of Razzleberry and Blush really set it off. 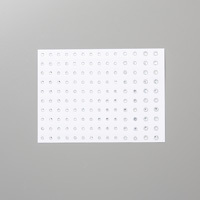 So when you get stuck--check out the samples in the catalog. 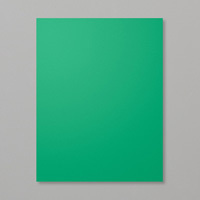 The colors listed under the pictures are: Basic Black, Blushing Bride, Granny Apple Green, Shaded Spruce, and Whisper White. 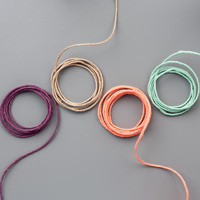 Any and all of these colors will form a great color combo for your card! 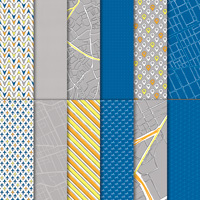 So next time you get stuck trying to select colors for your project...you have tons of great sources to get unstuck! Have fun and Create something every day! What Colors Should I Use to Create My Card? Do you ever sit down to create a card and think "What Colors Should I Use to Create My Card?" Do you ever get a block and just can't pull together colors that look good? 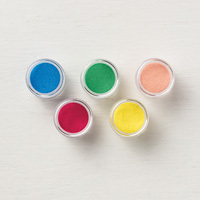 Are you tired of using the same 2 or 3 'go to' colors every time you get creative? Do you get a block on design and can't even match Black and White together---well join my club! All of us hit that wall as one time or another. This week we're going to take a look at some solutions to this dilemma so that when it happens you can break out of your block or your rut and get a new fresh set of colors to create with. 2. We often talk about getting card designs from Pintrest, so a long time ago I started a Color Combo Board on my Pintrest site. 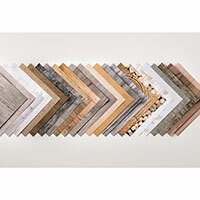 Here's the link to that board---there are tons and tons of color combos and I'm adding new ones each day...click here to start scrolling https://www.pinterest.com/sandihartka/color-combinations/. If you want to see new color combos every day--you can follow my board--just hit Follow. 3. One other great source of inspiration is to look out your window--or take a walk. Take a look at this scene in nature...what Stampin'Up! colors do you see here? Melan Mambo? Granny Apple Green? Early Espresso? What a great combo to begin working with a new combo of colors! But, that's not all...tune back in Friday and we're going to have some more great ideas for you...in the meantime, write a message below this post and let me know your favorite new colors from the new Stampin'Up! colors this year! 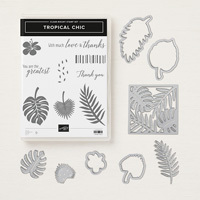 Today we're creating Another Tropic"ally" Chic card that is very lovely but quite simple using our pack of Tropcial Escape Designer Series Paper. This pack of DSP has some really eye-catching designs...so save the directions for this card and substitute some of the other designs to vary the "look." Change the greeting and you can have birthday, thinking of you, or get well! 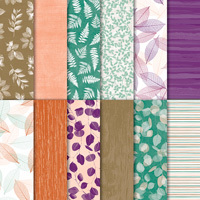 Best of all the Designer Series Paper Sale (Buy 3 Get 1 Free) is on until 7/31...so get yours order while there is still time! *Place your online purchase using Host Code 4VRD2FBM and you'll receive $5 in product for each $50 in product that you order. *Place your online purchase using Host Code 4XBU4TDD and you'll receive a Thank You + a $5 off coupon for your next class at my studio. 2. Cut Shaded Spruce cardstock 3 3/4 X 4 1/4, adhere to middle of card front with liquid glue; cut DSP (I used the floral pattern in Tropical Escape set) 3 1/2 X 4 1/4; Adhere to middle of Shaded Spruce. 3. 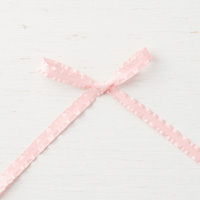 Wrap 16" ruffled Powder Pink ribbon around card (see picture for placement) and tie in a bow. You may want to secure to card front with a glue dot. 4. 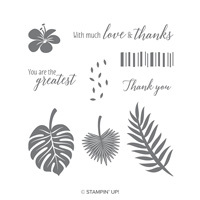 Stamp "Thank You" (Tropical Chic stamp set) in Stazon Jet Black ink below the designer paper toward the right side. We're creating a quick & easy card with Stampin'U bp! 's Tropic"ally" Chic Suite. 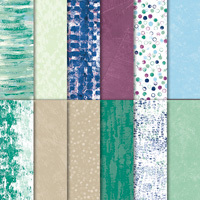 We're still celebrating the Designer Series Paper sale (Buy 3 Get 1 FREE) using one of the sale papers today. I'm focusing on quick & easy...everyone wants to be having summer fun but still be creative. 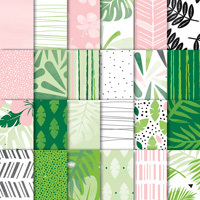 We're using the Tropical Escape Designer Series Papers---a group of terrific summery designs---tons of selections to choose from. *Submit your online order using Host code 4XBU4TDD and for each $50 in product that you order you'll receive a Thank you + $5 off Coupon for your next class at my studio. 1. Cut Granny Apple Green cardstock 4 1/4 X 11, score long side at 5 1/2 (card base); Cut Basic Black cardstock 5 X 3 3/4, adhere to card base with liquid glue. 2. 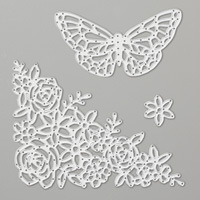 Cut designer paper (I used the pictured pattern from Tropcial Escape pack) 3 5/8 X 4 7/8. Adhere 5" piece of Granny Apple textured ribbon around middle using glue dots--tuck ends around back. Adhere DSP to card front with liquid glue. 3. Stamp "You are the greatest" (Tropical Chic stamp set) in Stazon Jet Black in on a piece of Lemon Lime Twist cardstock, punch out with Tailored Tag punch. Using the small background stamp in black ink....stamp randomly around the verse. 4. 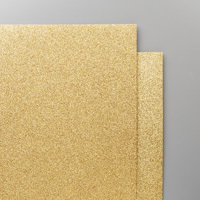 Punch gold glimmer paper with the same punch, cut down the middle horizontally & attach to back of above tag with glue dots. spreading apart slightly so it forms a border around the verse punch. 5. Adhere Tropical element flower above the verse with a glue dot. 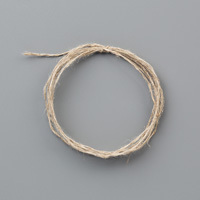 Using 2 strands of linen thread tie a blow & adhere to flower front with a glue dot. Attach whole unit over ribbon with dimensionals. Below are the Supplies--use Shop now button or click on one of the images below --go shopping in my store! 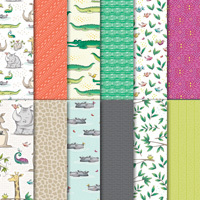 As you know if you've been to a class lately I've fallen in love with a designer paper, so today you'll discover What's New with Animal Outing Designer Series Paper! Pretty cute, right? This could be a fun card for office co-workers, guys, kids, or your girlfriend who loves animals--it's just adorable. 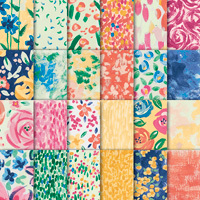 As I mentioned, the good news is that this is one of the ten Designer papers that is on sale this month (through July 31st)...if you buy 3 you get one FREE! Not a bad deal, right? 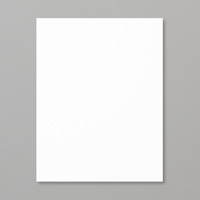 Below in the Supply list are pics of the ten designer papers on sale--you can click on the Shop Now button or on one of the images below and you'll be in my store. If you place your order online and use the current Host code (4VRD2FBM) when you are checking out, you'll receive $5 in Stampin'Up! product from me for each $50 in product that you purchase. 1. Cut Color Me Clover 8 1/2 X 5 1/2, score the long side at 4 1/4 (card base); cut Basic Black cardstock 4 X 5 1/4; adhere to the card base with liquid glue. 2. Cut three pieces of Animal Outing (small animal print) 1 1/2 X 3 7/8, adhere to black cardstock with liquid glue. 3. Cut Simmering White cardstock 1 1/4 X 2; stamp Wild about You (Animal Outing stamp set #146600) in Color Me Clover ink (147139); Cut Gold Glimmer paper 1 1/2 X 1 3/4--adhere to back of Shimmering white with glue dots; adhere to card front with dimensionals. 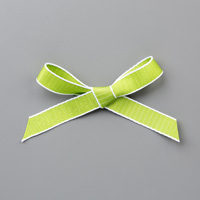 Tie green cord (Nature's Twine) in a bow and adhere to verse with glue dot. 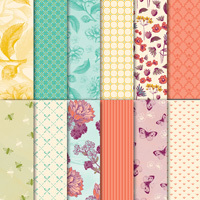 Here's the supply list along with the ten designer papers that are currently on sale. Click on the Shop now button or on one of the images below and start shopping! 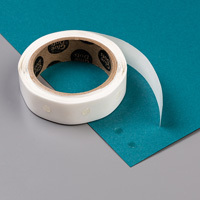 Since we are using narrow strips of designer paper, we can get tons of strips from one sheet. This means you can make multiple cards with just one sheet. You'll also see the new Rose Glimmer paper--this is just stunning--used with the Thank You Thinlets which creates this beautiful effect with very little effort! Aren't we always looking for awesome with little effort? Following the directions to create this card there is a supply list--you can click on the Shop Now button or on one of the images below to get into my store. 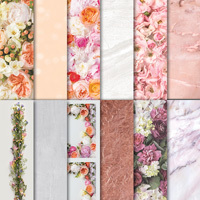 Remember there are ten designer papers that are on sale during July--they are included below so you can see all of them including Petal Promenade. If you purchase 3 of these designer papers the 4th one is FREE. And, if you use this month's Host code when you check out (if you are shopping online) 4VRD2FBM--you will receive $5 in Stampin'Up! products (I select them) for each $50 in product that you purchase. 1. 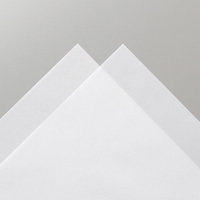 Cut Blackberry Bliss cardstock 8 1/2 X 5 1/2, score the long side at 4 1/4 (card base; cut Whisper White cardstock 3 1/2 X 5 1/4, adhere to card base with liquid glue. 3. Cut scalloped oval with Layering Oval dies (#141706) from Vellum cardstock (sandwich: magnetic platform, Precision base place, vellum, die, standard cutting pad). 4. 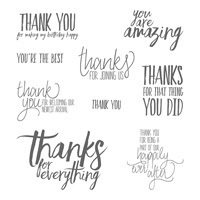 Cut Thank You (Thank you Thinlets) from Rose Glimmer paper; adhere to vellum with glue dots; adhere the Oval to the card front by placing glue dots under the letters of Thank You so they will not show. Here are the supplies--click on one of the images below or on the Shop Now button and you'll be in my store--order your supplies now! We used the Eclectic Layers thinlet and cut out some of the designer paper so we see the layer of cardstock underneath...what a difference that small action makes in the professional look of the card. 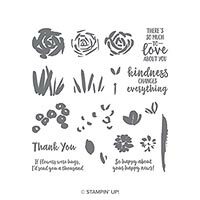 You can use any of the new Stampin'Up! Designer Series Papers to use this fun technique. 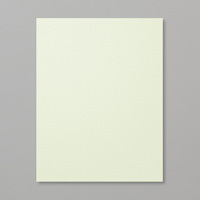 Remember, the Designer Series Paper Sale lasts all month...however I advise getting yours now. This sale is bound to attach the inventory and low supplies might mean a wait--so order now while supplies are good! Buy 3 packs of DSP (the ones listed in the attached brochure Download 07.01.18_FLYER_DSP_SALE_US) AND Get 1 FREE. If you place your order online and use the current Host code 4VRD2FBM you will receive $5 in Stampi'Up! product from me for each $50 in product that you purchase. 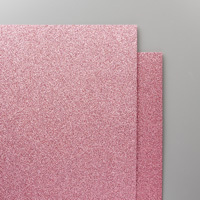 Following the directions for making this card are the Designer Papers that are on sale and the product used for today's card- -click on any of the images to get into my store to place your order. 2. Cut Tea Room Designer Series Paper (Coastal Cabana design) 4 X 5 1/4; using the background thinlets (Eclectic Layers thinlets) cut the design in the upper part of the paper (magnetic platform, Precision base plate, paper, die, standard cutting pad). With a sponge (141337) and Coastal Cabana ink (147097) sponge the outer edge to give it the "look' of another layer. Adhere this to the card base using liquid glue. 3. Cut the solid flower (Eclectic Layers thinlets) from Mango Melody cardstock; cut the flower outline from Calypso Coral cardstock (122925). Glue these together with liquid glue and adhere to card front with a dimensional. 4. Cut leaf stem from Bermuda Bay cardstock (131197), slip under flower and glue with liquid glue. 5. 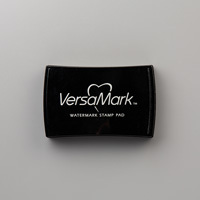 Stamp with your favorite greeting in Stazon Jet Black ink. Your card is ready for sending! Here are the supplies and the Designer Papers that are on sale--click on any of the images and you'll be in my store--order yours now! 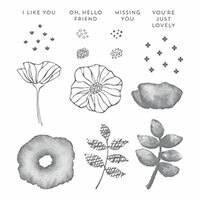 Did you see the new special for Free Stampin'Up! Designer Series Paper? 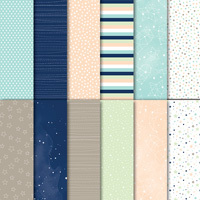 During the entire month of July, if you purchase 3 packs of Designer Series Paper, you get one pack free! This is definitely the time to stock up! Below are the selections you can choose from. 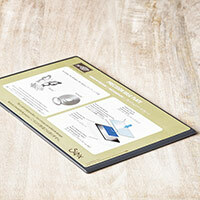 Here's a quick and easy card that uses the Garden Impressions Designer Series Paper (it's one of the sale DSP). See how it uses the DSP instead of plain cardstock for the framelit cutout--that really makes the card much more interesting and adds a bit more pizzazz. Here's a close up so you can see the added interest using the floral DSP gives the card front. I'll give you the directions following by the supply list below---the first products are the Designer paper on sale...the second list is for the product used for the card...go shopping and have fun! Remember if you place your order online and use the current host code (4VRD2FBM) when you check out, you'll receive $5 in Stampin'Up! product from me for each $50 in product that you purchase...free product and Free designer series paper....have fun shopping right now! 1. 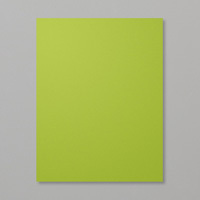 Cut Mango Melody cardstock 8 1/2 X 5 1/2, score the long side at 4 1/4. 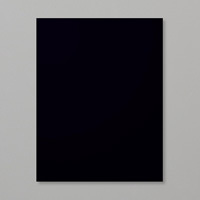 Cut Basic Black cardstock 4 1/8 X 5 3/8; adhere to card front with liquid glue. 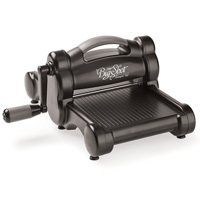 (*sandwich: magnetic base+precision base plate, DSP, standard cutting pad). 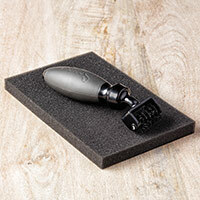 Use the die brush to remove the cut out pieces. 3. 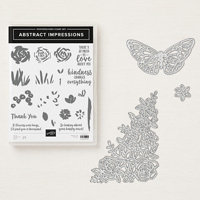 Use the embossing buddy on the upper right corner, stamp verse (Abstract Impressions stamp set) in Versamark ink, sprinkle with Grapefruit Grove embossing powder, heat with heat tool until shiny. 4. Add 3 clear rhinestones..your card is completed!